It’s been almost 8 months since I was first published in The Huffington Post. The time I spent researching how to pitch publications and then actually sending them out felt like forever, but once I was accepted (by Arianna Huffington herself! ), the turnaround time was almost instantaneous. It felt like a whirlwind as my post was published and I obsessively checked my stats throughout the day and easily saw the largest number of views I had ever had. Everything I had read about being published in The Huffington Post had to do with breaking through that barrier and finding an editor to read and approve your pitch. The story seemed to stop there and since I was so focused on that initial acceptance, I didn’t think much past that goal. Since I’ve had almost a year of working with them, I want to take some time and share with you what to expect after being published in The Huffington Post. My initial post was published on January 28th 2015 and my numbers skyrocketed. It was also shared on HP’s social media channels and I saw 5.5 times the number of views from the day before. There was another spike in visits on February 1st as they shared it again on social media. This time there were 12 times the number of sessions from the day before. I was ecstatic. I’M FAMOUS. Flying high from the increase in traffic and the ego-boost I got from adding “Huffington Post writer” to my media kit and social media accounts, I decided to submit more posts. Once you become a Huffington Post blogger, you are able to submit posts at your leisure. In the month of February I published 3 more posts, each a week apart. I would have submitted them daily if I didn’t think that people would think I was crazy. A funny thing happened. Can you tell which days my posts were published? Neither can I.
I frantically scanned Twitter and Facebook to see if/when HP would link to the genius words that I had to share with the world, but I couldn’t find any mention of my posts. I got a few comments or likes here and there, but nowhere near the numbers I saw with my first post. I did some research on other Huffington Post bloggers and found a couple mentions of similar results after posting the first time. Disheartened, I skipped posting in March and ended up posting twice in April. Most of the posts I would publish were ones that had already been published on this blog in an attempt to reach a larger audience. The second April post was an original one I wrote about why I don’t drink. Again, sometimes I would see a slight increase the day of or a couple days after, but nothing exponential. Life got crazy from May to August and I forgot about The Huffington Post. When I remembered, I decided to submit another post. This time, however, I thought less about promoting the content that I thought was AMAZING and took some time to look at what the readers were interested in. I spent time on the healthy living section of The Huffington Post since that is where my posts tend to be published and looked at what types of posts were resonating with the audience in terms of shares, likes, and comments. The post I shared in September, a version of 5 Ways To Improve Your Relationship With Yourself, brought in about 6 times the amount of traffic from days prior. From my research, it doesn’t look like Huffington Post shared it, but because it was a topic that aligned with their readers, it was shared by more of them than previous posts. My strategy for posting on The Huffington Post is to do so once a month. This blog is what holds everything else I do together and without it I wouldn’t have these same opportunities. Rather than put my time and effort into something outside my main passion, I choose to use it as a supplement. I have received a number of comments and contacts from the pieces I have published on The Huffington Post, but from my experience and the experience of others I have read, subsequent publications fail to bring in the same level of engagement as an initial post. This is not a bad thing, just something to take into consideration when managing expectations and planning your overall blogging or writing strategy. I still love being published on The Huffington Post, but when I submit an article I make sure to research what topics will appeal to readers in order to maximize the reach that a post can have. The more it aligns with their content, the more likely they will be to share it with others. This is true not only for The Huffington Post, but for any publication where my writing is published. I hope this helps shed some light on part two of being published on a large outlet like The Huffington Post. If you have any questions or want to see a post about something in more detail, feel free to email me or leave a note in the comments! 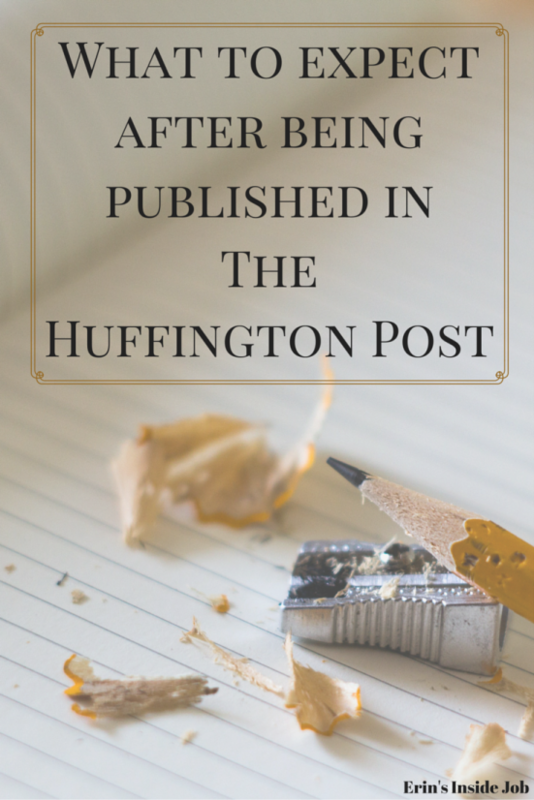 What happens after being published in The Huffington Post? It may not be what you expect! Super interesting. When I was published on Women’s Running, I saw a small uptick there but again when they shared it on social media as well. Have those readers stayed? It is hard to say. You always hope that they will, but since they aren’t commenting, I can only go by random stats after that day! Interesting Erin! I’ve had a few posts on Elephant Journal and other content-driven online mags, plus 2 print magazine sites and have seen hardly a blip in views from those. The most views I get is when a syndicated writer friend (James Fell) shares my stuff on his FB page. Maybe I’ll try HP one day! This is a goal of mine for some reason. I feel like saying I’ve been published on Huff Po is so big! I’ve pitched a few ideas that Arianna has personally replied to stating an editor would contact me but then nothing. I never hear from the “editor.” It’s frustrating and a little disappointing. Is the traffic spike to your own site? Yes those are my own site stats. HP doesn’t allow you to see stats for your particular post on their site. I would email her back if someone was supposed to contact you and hasn’t yet! Did you hear back from them? Even I got a similar mail an d I am waiting. Thank you! Haha you’ll never know if you don’t try! That’s super interesting, Erin — thanks for sharing! I’ll admit that I rarely ever click over to the author’s blog when I read their articles on bigger sites, and it’s a shame that you didn’t see more traffic from it. But I still think that being able to say you’re a HP published blogger is pretty freaking epic! Amanda @ .running with spoons. recently posted…. sweet and creamy pumpkin spread . Yep. Never been published on HP. However, when I was a baby-newbie blogger, I used to SPAM their comment section with links back to my blog! BIG NO NO! LMFAO. I was banned from leaving comments. Although I have to say, my comments weren’t like. “Cool. [link to blog]” – I actually left lengthy comments and what not, but any link = spam! AH HA HA! OHHHHHHHH WELL! You gotta learn the hard way sometimes! Haha good to know! That’s hilarious! Writing for the Huffington Post is one of my goals. I think I actually found your blog through your initial HP article. 🙂 Thanks for sharing your experience since. It’s much appreciated! Thanks for sharing your experiences, Erin! I’m in the midst of figuring out where I want to take my blog – to keep as a “hobby” (a very time consuming one) or sit down and make some business goals. Sitting down and making lists and brainstorming is always helpful to me in figuring out what to do. That and pro/cons lists. Thanks so much for sharing this. I also noticed that all the info out there just focused no getting published. I submit my first post to Huffington Post in September and it was approved by Arianna, so I got the invitation and everything to be a contributor. I submit my post, but I have not received an email saying it was published or seen it on their site. It’s been 2 weeks now. Does that mean that even though Arianna approved it the blog team passed on it? I’m not sure what to do from here. Hmm. If you got the invitation and were able to submit it through their site then it should have gone up by now (in my experience). At most it’s only taken a couple of days. I would email either Arianna or the blog team to find out what’s going on. I had the exact same experience as Grace. And yours is the only blog I could find that has info on what happens AFTER getting accepted to Huffpost so thank you for writing this!! I got the acceptance from Arianna and the invitation to the blog team. But it’s been over a month since I submitted the post that Arianna accepted and it never went live. I emailed them 3 times (the 1st time I received a generic reply that said they were most likely just busy, and then no reply to the other two emails) and a couple days ago I finally just resubmitted it. Getting invited to Huffpost is the biggest thing I’ve had happen since I started blogging and it’s so disappointing that it seems to have gone nowhere! That’s so weird! Congrats on (almost) getting there. At least you have the login so you can go ahead a resubmit. I hope that they’re able to get it published! The most it’s taken me is a couple days so I’d definitely get on their case if it’s longer than that. Hi Erin – I agree with others that it is so hard to find any info on what to do AFTER you’ve been published on HuffPost, so thanks for sharing your experience. I feel weird for asking this via a comment, but I just published my first piece with them: http://www.huffingtonpost.com/entry/in-jordan-refugee-girls-overcome-hardship-through_us_57b60a45e4b007f181974ad5 And I cannot for the life of me figure out how to find it through their website (which section it was published in), nor can I access it by searching my name. I am quite perplexed! Any tips you could share would be much appreciated. Thanks! Hey Dominique! Check out my latest piece about the changes they’ve made to their platform (search for “Athena” on my site and you should find it). At this point the link you have is your best bet, so promote it out there as much as you can! Hope the post helps! I offered a full post to HP. I got a mail that I will get a password and then I can share my voice. I have a few questions on it..
1) Is my story already accepted and they are going to publish it. As I got the mail because of this story. 2) I will get an HP account and will paste the same story and then it will get published. As assuming it is already approved that’s why I got the mail to share my voice on HP. 3) I’ll get an username and password as I am selected based on the story that I shared. But now I have to publish a new story on Athena and wait. The story because of which I got a response was a selected story to get published by them or was it just considered as a sample article to make me HP blogger. I stopped writing for a few years for family reasons, but the current election has me hitting the keyboard again, with some new observations. 2. In the old days (2008-2013) when I writing more regularly through my HuffPost Blogger Backstage portal, EVERY article published was found on one of their category pages, and the comments were staggeringly prolific. NOW, being published through that same backstage portal gets me editorial notice right away, and a few random comments and likes from the other bloggers who also have to putz about looking for their article. It’s much harder to be posted on a category page where random strangers will see it. I’m a bit disheartened. I don’t have a blog, nor do I want one. I just liked writing for a wide audience through HuffPo. The answer seems to be to up my game, and become a superstar HuffPo writer, if I want my articles to have any significance. Anyway, those are my observations, just in case they help anyone here. Thanks so much for your comment Susan! I agree w your observations and even wrote a whole post on the new platform and why I stopped contributing. It’s definitely a lot more diluted now and doesn’t hold quite as much weight as I feel it once did.